He wasn't just an astronaut in real life -- he also played one on television. (Better still, he also appeared as himself in some first-rate documentaries -- most notably, For All Mankind.) When it came to filming The Right Stuff, of course, he was played by Lance Henriksen. 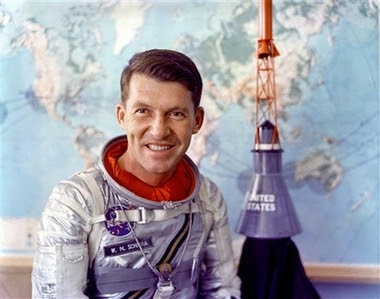 But when it came to actually possessing that rare quality indelibly labeled in Tom Wolfe's non-fiction best-seller, Wally Schirra was the real thing, one truly righteous dude.